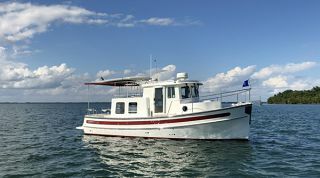 The new Nordic Tug 40 is built with solid, hand-laid fiberglass hulls, many panels made with vacuum infusion, and balsa coring in the deckhouse. The full keels are constructed from one-inch-thick laminate. A heavy-duty stainless shoe protects the prop and rudder. 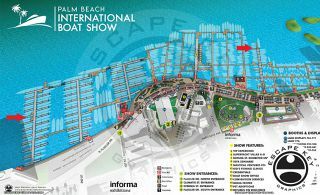 The semi-displacement hull has integral chines, a bit of flare in the bow for a dry ride, and plenty of freeboard. As I can attest, the large prop and barn-door rudder make maneuvering easy, and the bow and stern thrusters take care of docking. 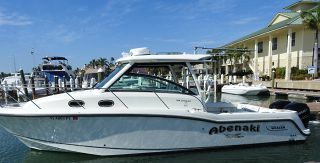 The new 40 did not have the optional pilothouse, but it did have many updates from the 39 that made the boat particularly appealing. Most obvious was the large cockpit, now extended two feet back, with a center door leading to a wide swim platform. The good news is that it’s flat from the swim platform to the cockpit, so you don’t have to step over a lip to get into the boat. You can also enter the cockpit from a bulwark door cut into the starboard side. Then there are two molded-in fiberglass steps and four more steps on the port side leading up to the boat deck on top. Two glass doors lead to the saloon, which allows plenty of light from these doors and from big side windows. 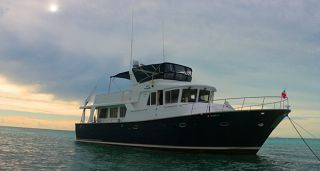 A modern, large L-shape galley is aft, immediately inside the doors to starboard. It has a stainless sink, convection microwave, three-burner stove, and Sapele-faced drawers and cabinets. 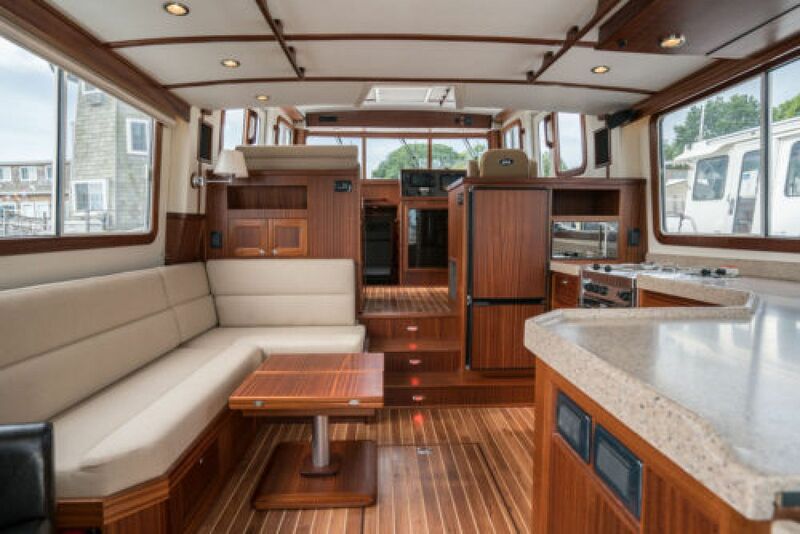 A 5-foot fridge/freezer is forward, backing up to the pilothouse. The countertop runs all along the starboard side and has four large drawers under the after section, and if you leave the doors open you can fold out an extension of the Corian countertop to serve guests in the cockpit (a very nice touch). A barrel chair is aft on the port side, and then there’s an L-shape convertible settee facing the same table as on the 44. The entire sole is teak-and-holly Amtico, for a bright and salty look. Forward, it’s two steps up to the pilothouse. On the 40, the helm station is off to starboard, since the steps leading down to the accommodation deck are centered. The pilothouse has the same side door and window arrangement as the 44. Two Raymarine HybridTouch screens rise from the flat black helm, as on the larger boat, and there are the controls for the Side-Power bow and stern thrusters. A nice, two-person seat is on the port side, and it’s open behind the seat so you can see all the way aft. 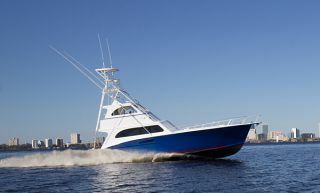 Lifting two hatches in the center of the pilothouse sole allows easy access to the engine room. Two big Racors are on the after bulkhead, the big Grocco is forward, and there’s room to work all around the D6, 370-horsepower Volvo. 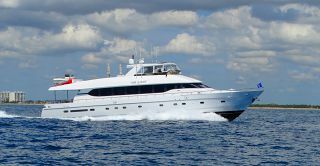 The 9kW Northern Lights genset is abaft the engine, although the owner, a former sailor, will use it only for the air conditioning because the boat is equipped with propane for cooking. 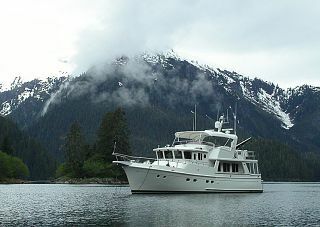 From the pilothouse, three steps lead down to the accommodation deck, where the guest cabin is on the starboard side. On this boat, there’s just a lower berth here, although an upper is available as an option. Two side ports and an overhead hatch let in plenty of light. A hanging locker with two lower drawers and a separate cabinet provide storage. The head is opposite, to port, behind a Sapele sliding door. It has a large shower behind two glass doors, with a seat and storage shelf, and a vanity cabinet with additional storage. The master is forward and it’s not a large as the one on the 44, of course, but it’s still outsized. I measured 6’ 6” of standing headroom at the foot of the walkaround queen bed, and there’s room to sit up and read in bed all the way forward. For storage, there are four drawers under the bed and you can lift up the mattress for more. Extra cabinets and hanging lockers are on each side. Out on the Connecticut River, the 40 had all the sure-footed tracking abilities of the 44, but it’s even more nimble because of its smaller size. 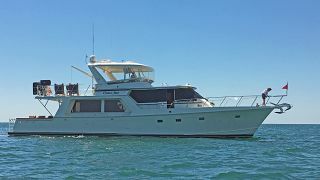 The 40 topped out at 17.5 knots average in a two-way run, and it’s fairly fuel-efficient, burning only 13 gph at 14 knots, an easy cruising speed. If you dial back to just under 8 knots, you’ll have a range of about 1,000 miles. What this really means is that the new Nordic Tugs 40, like the new 44, is a well-built, well-performing, serious cruising boat with enough room on board to keep you out there for as long as you want.